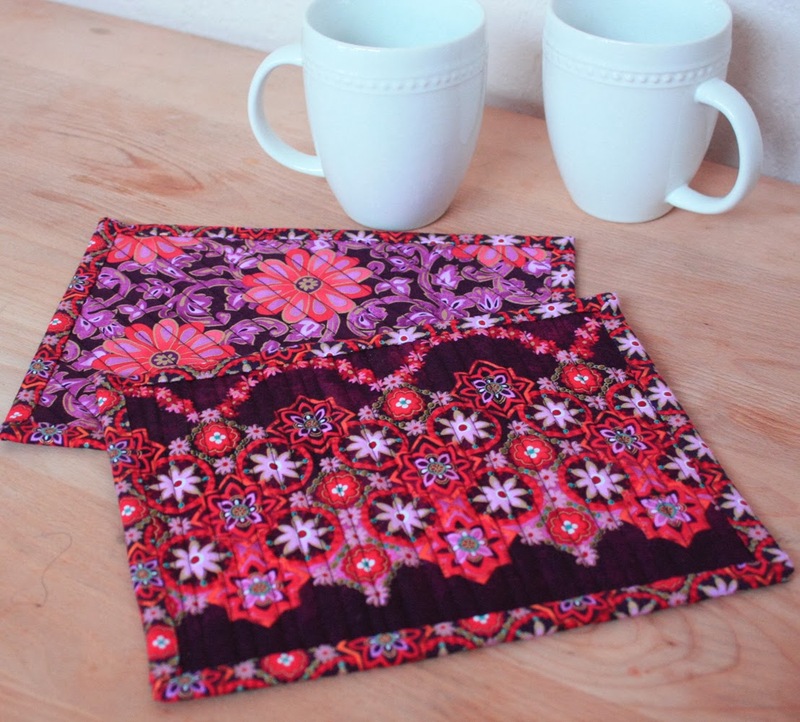 We're so glad you joined us for day four of the Mug Rug Blog Hop. 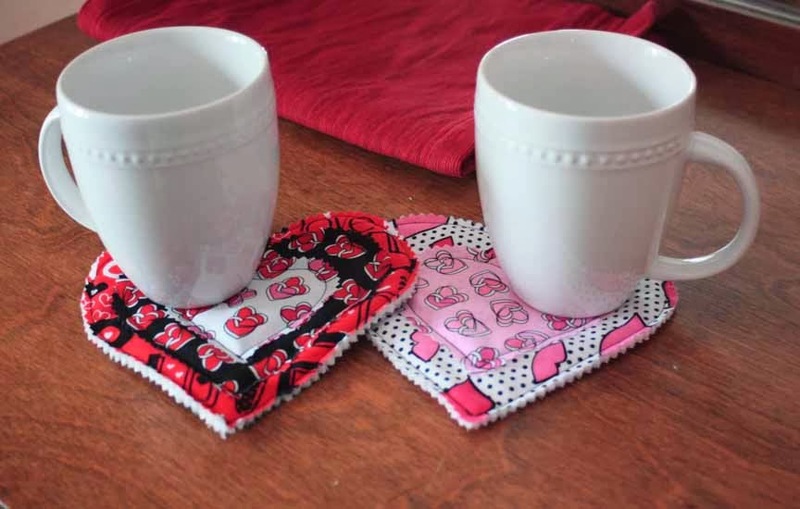 Today we're getting a head start on Valentine's Day with some sweet heart-shaped mug rugs. 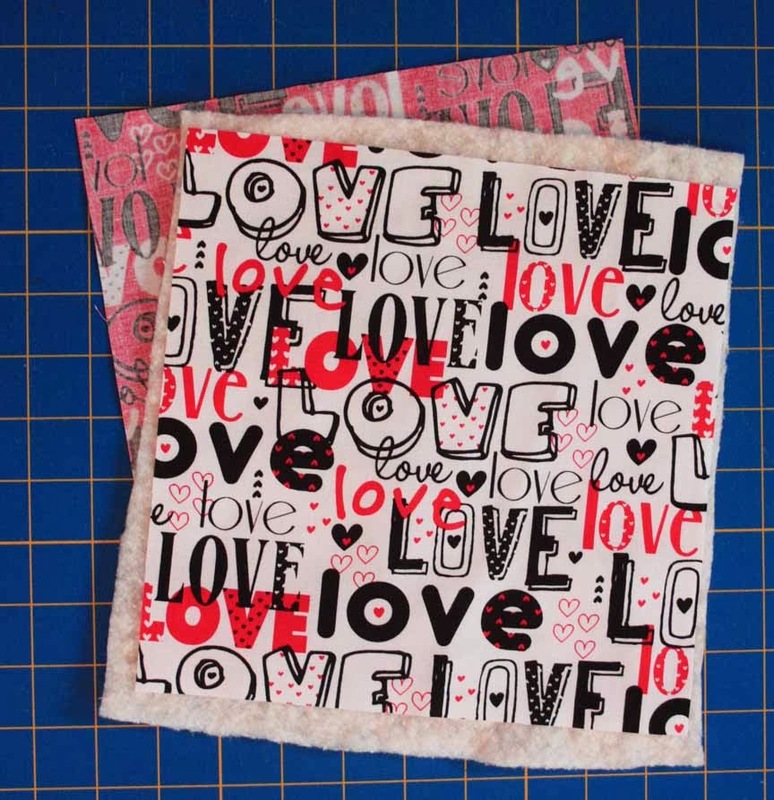 Our design team used two Kanvas lines: Smooches by Greta Lynn and Puppy Love. Don't miss your chance at the end of the post to find out how to enter for a chance to win a fat quarter bundle of fabric! 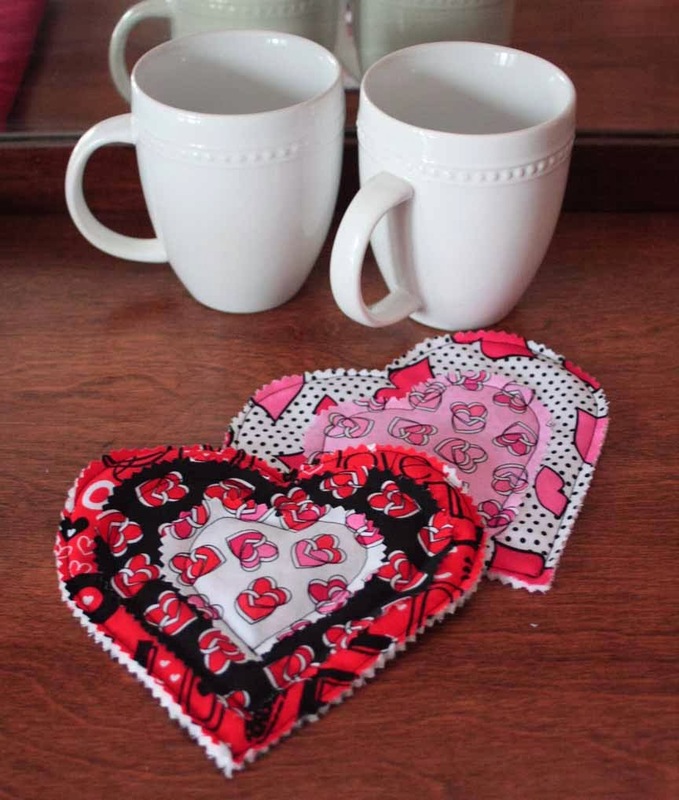 Grab a mug and pull out those valentine chocolates! 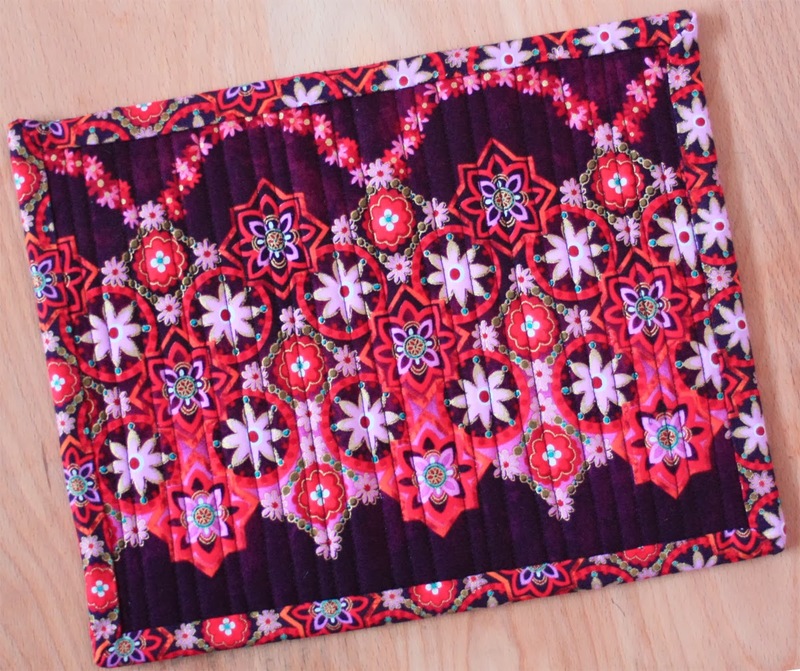 It's time to make a mug rug! 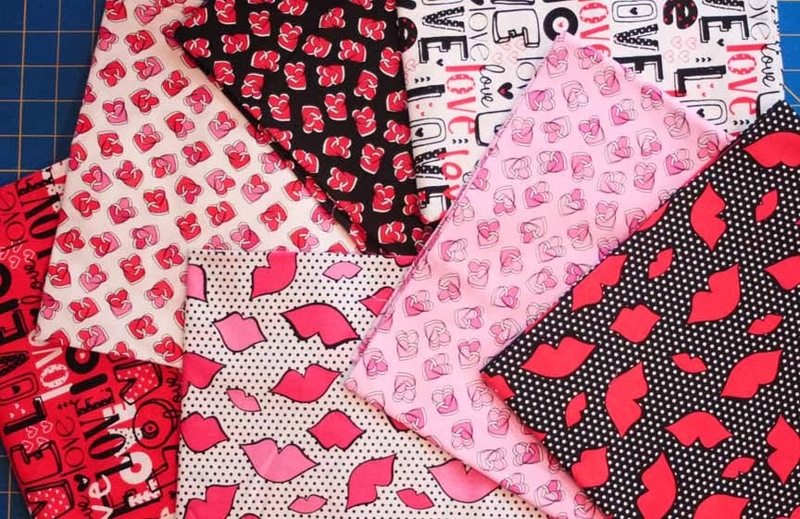 Smooches and Puppy Love: We <3 these prints! 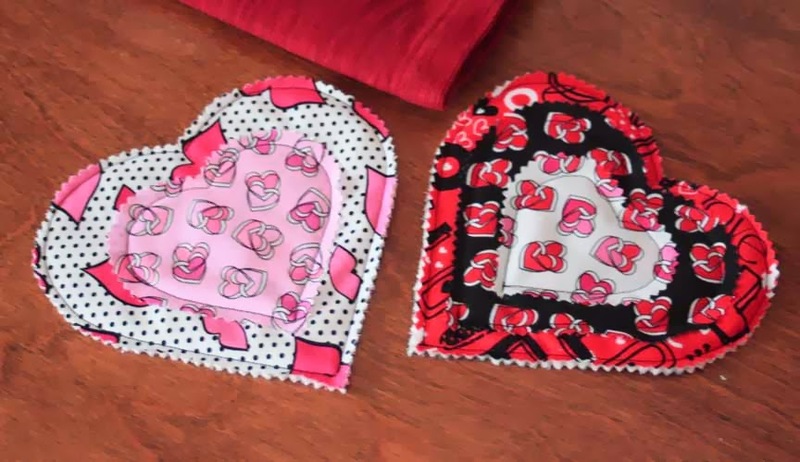 Click here to download the pdf of the heart templates. 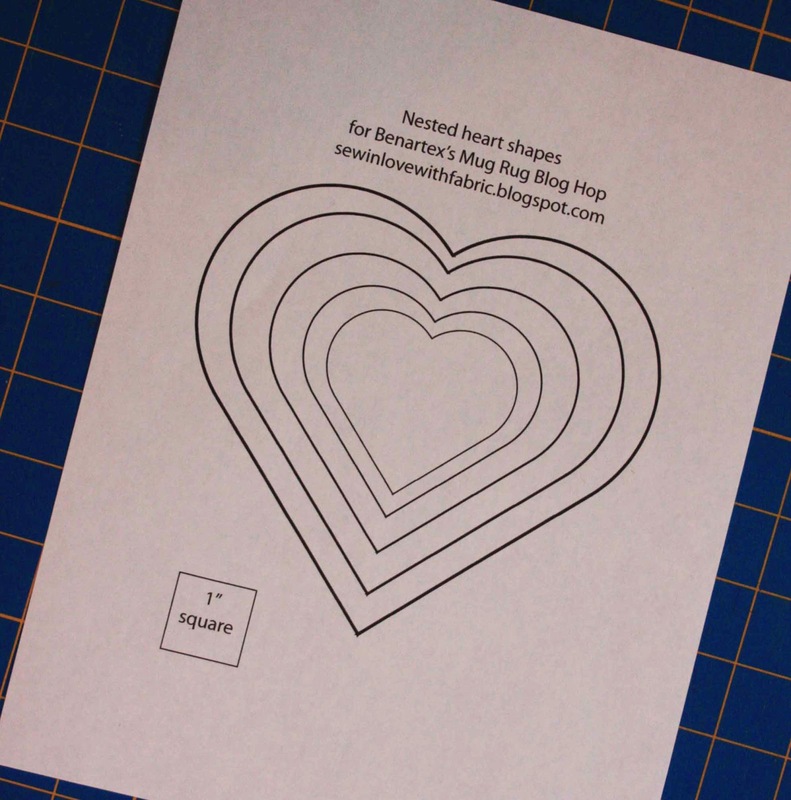 Print out the pdf with the heart templates and choose which size hearts you want to use. We used the largest, the 3rd largest, and the smallest on one mug rug, and the largest and 2nd largest on the second mug rug. 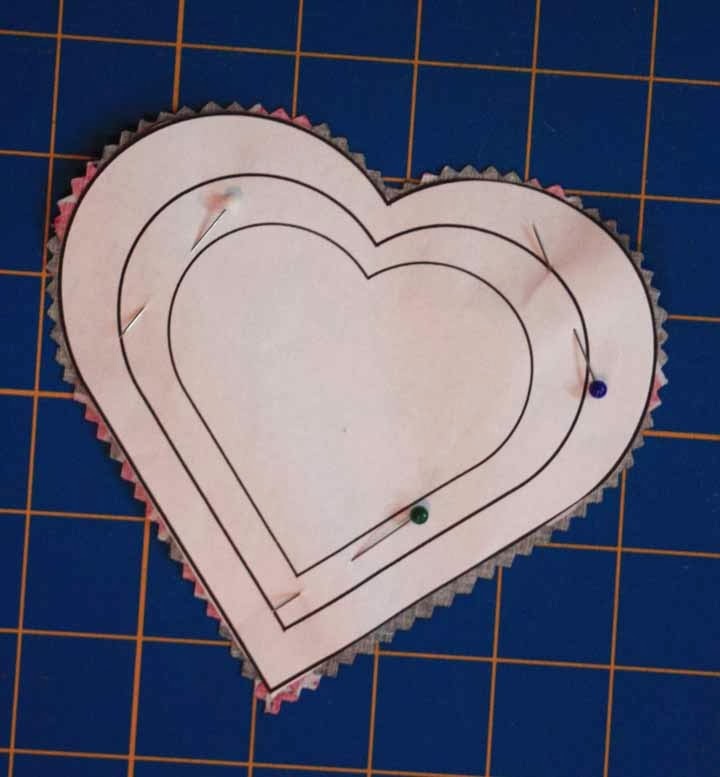 Cut out the heart templates you want to use. 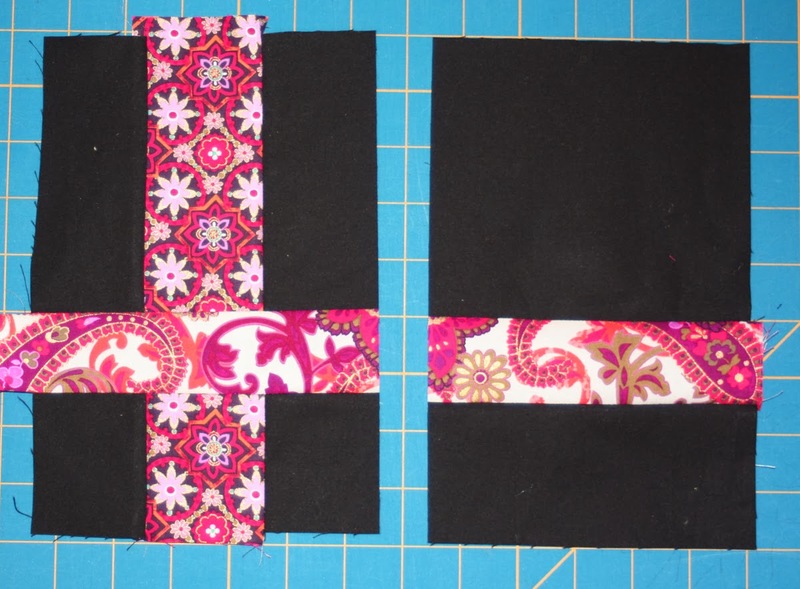 Cut two squares of fabric 2" larger than your largest heart. This will be the back and the background of the mug rug. Cut a batting square the same size. 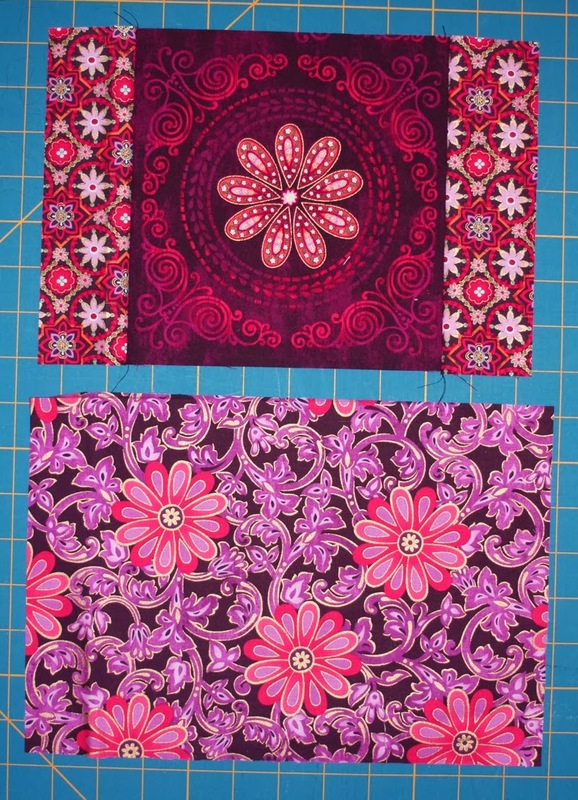 Layer the backing fabric, batting, and background fabric right side up. Pin the cut out heart template on top. 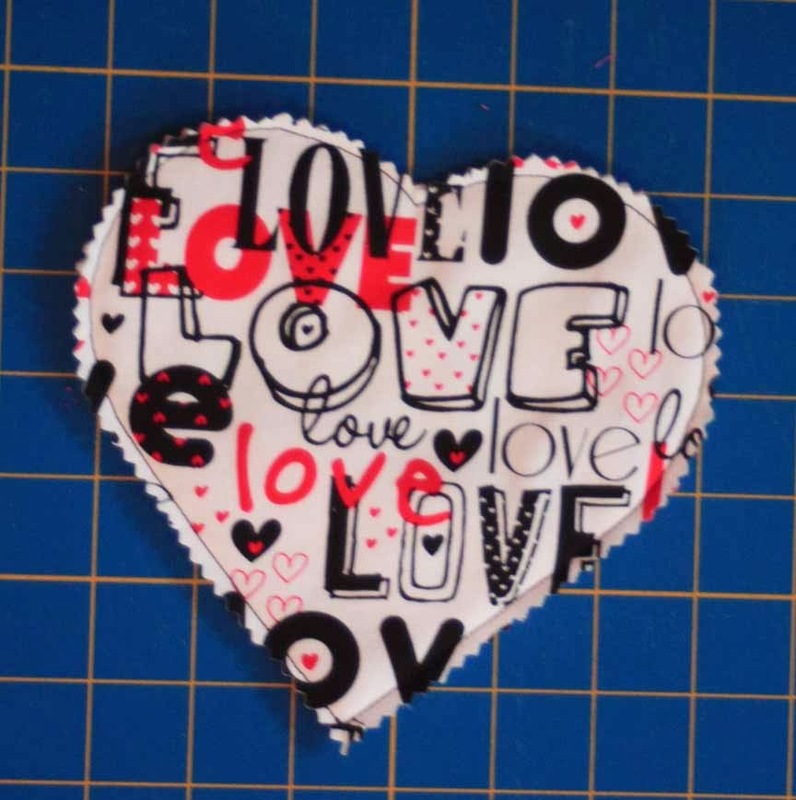 Stitch around the outer edge of the paper heart. 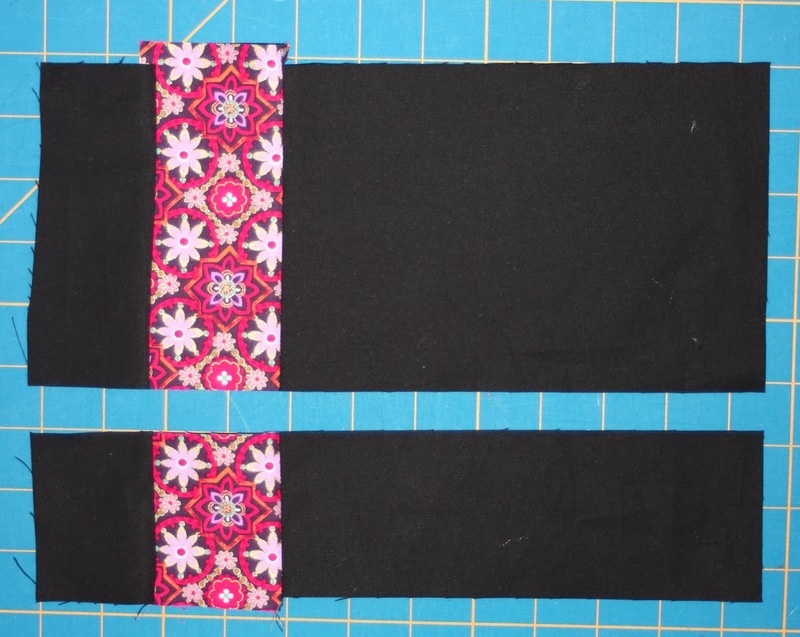 Use a walking foot for easier sewing. Remove the paper heart. 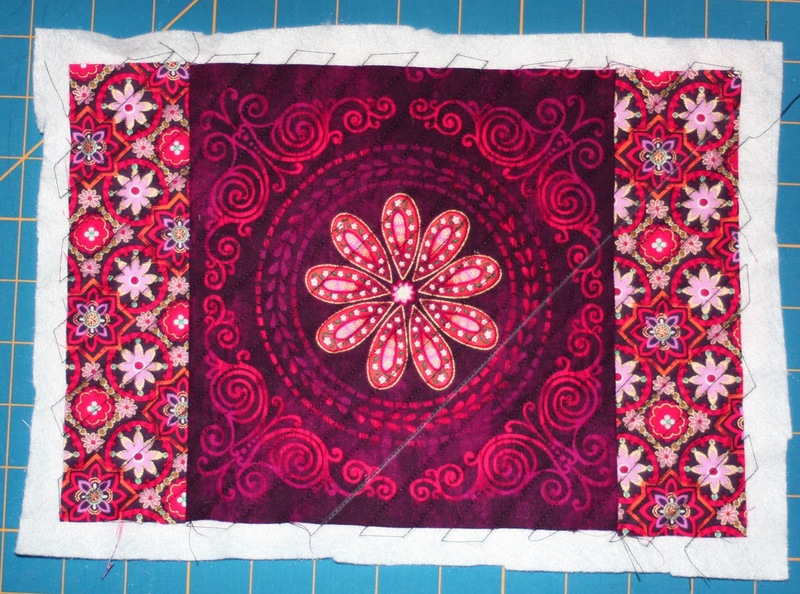 Using a pinking shears, cut out 1/4" past the stitched line. 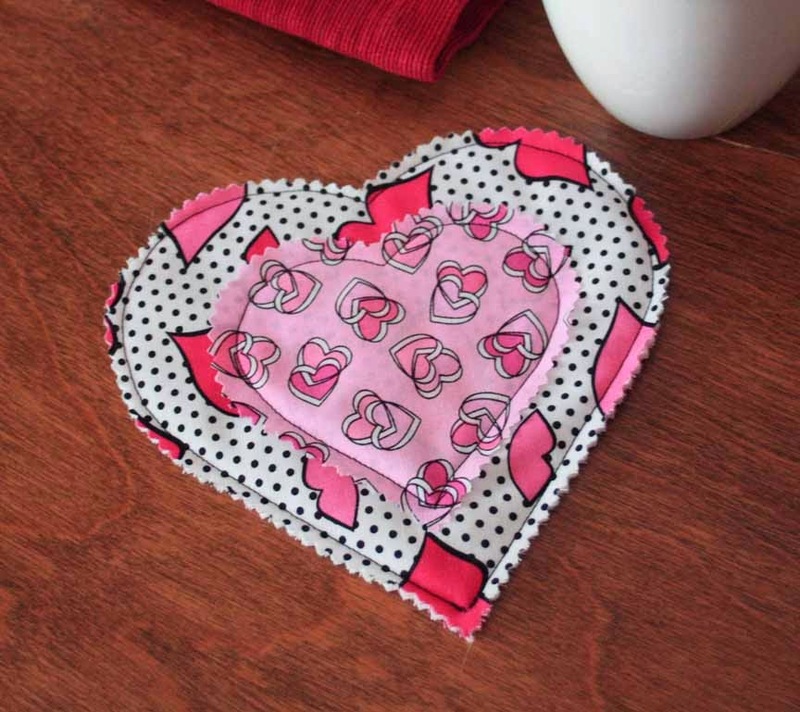 Choose your second heart fabric and heart template size, cut out a fabric square 2" larger than the template, and pin the template to the fabric. 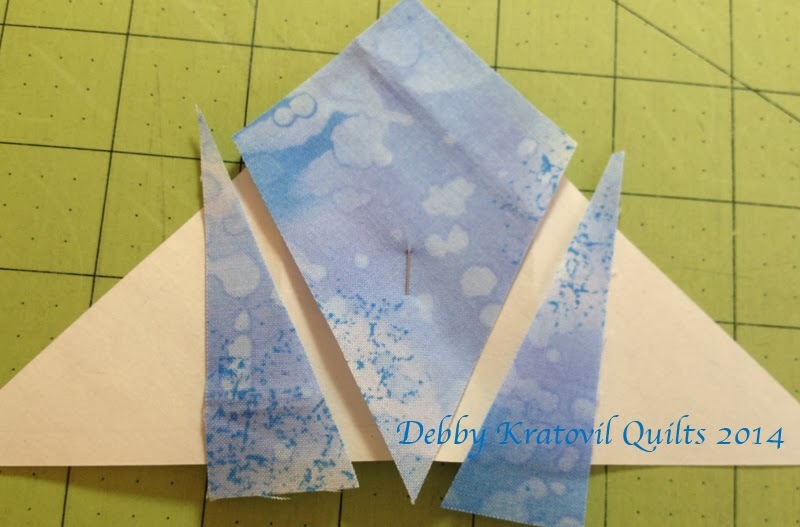 Cut out just past the template with the pinking shears. 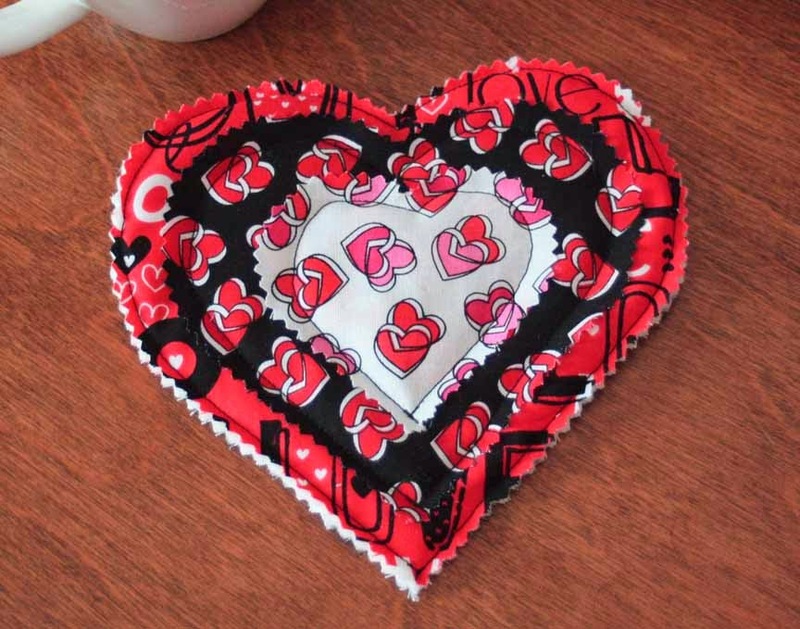 Position the medium-sized heart on the quilted large heart, center and pin. Stitch 1/4" inside the pinked edge to secure to the background. 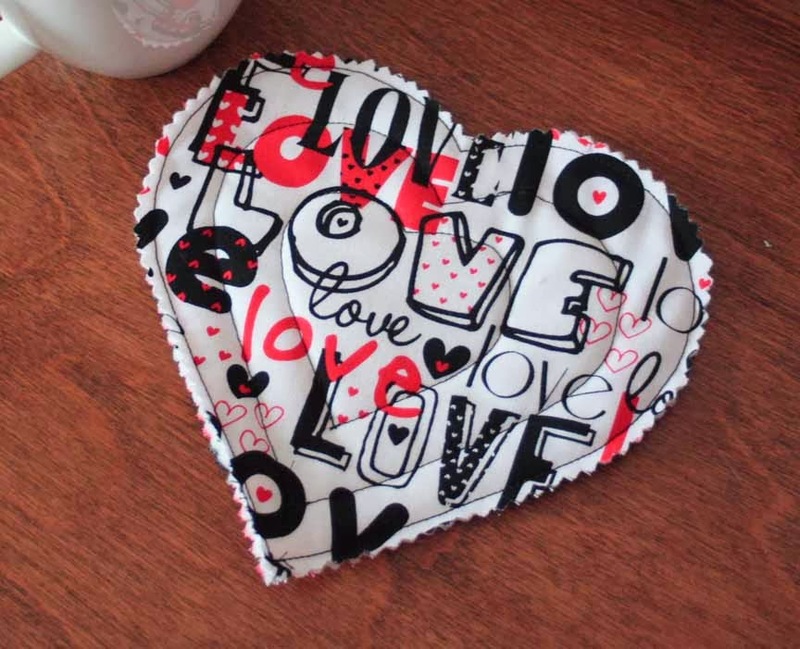 Repeat to make and sew on the small heart. 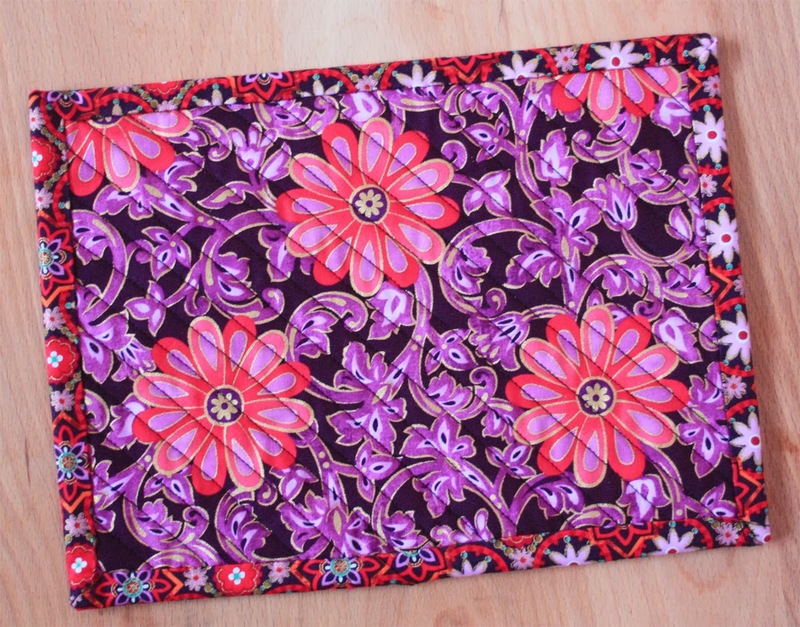 Here's our second mug rug, made in the same manner. Cute, aren't they?! 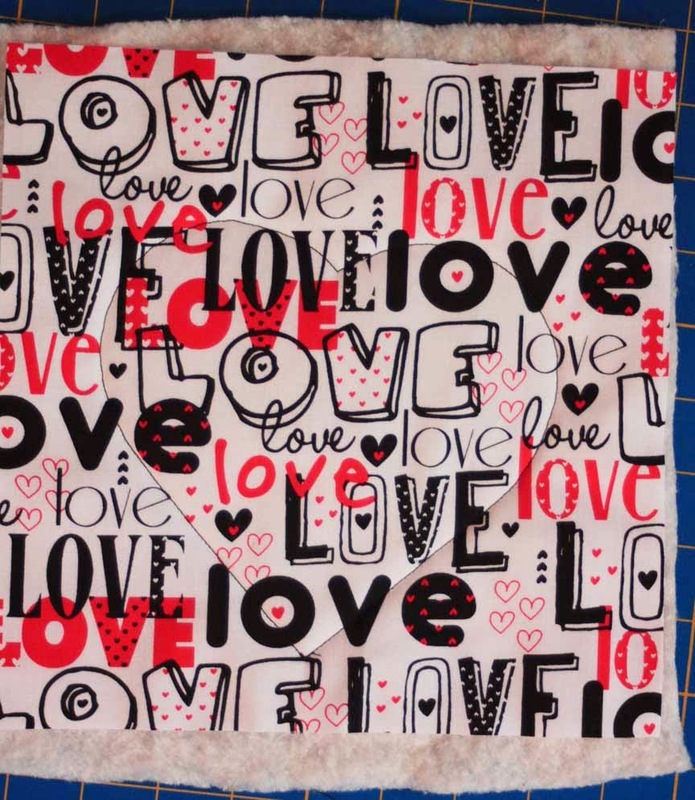 Perfect for spreading a little love for Valentine's Day! For a chance to win a fat quarter bundle of Benartex or Kanvas fabric, simply sign up to follow this blog, either through Bloglovin' (or another blog reader service) or email (both options are in the right hand sidebar) and leave a comment letting us know you follow. In your comment, also tell us your favorite thing about Valentine's Day. Leave a second comment and receive a second entry by following us on Facebook and letting us know. This giveaway is open through Friday, February 7 at 11:59 PM EST. 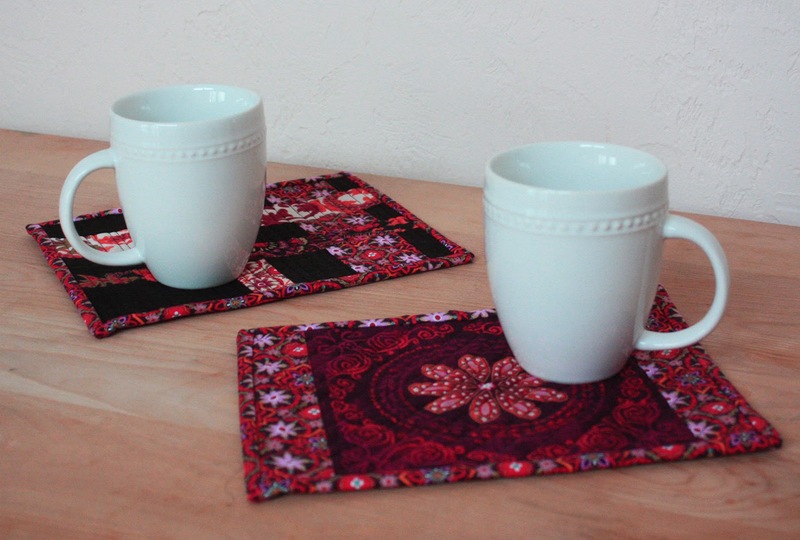 Welcome back for the third day of our Mug Rug Blog Hop! 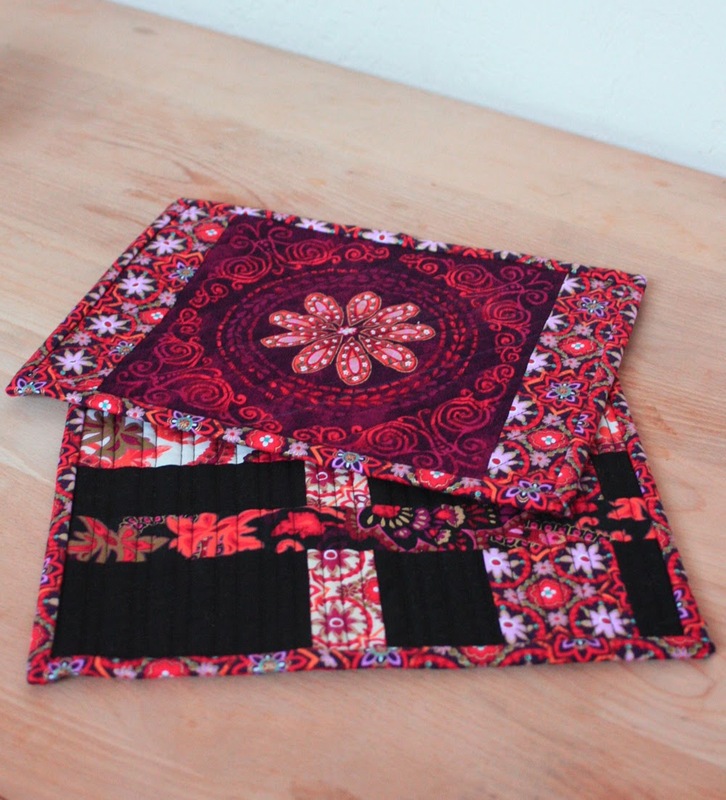 We hope you enjoy the tutorial below, part of a Hostess Gift Set designed by Stitched Together Studios using the Shaken or Stirred fabric collection. 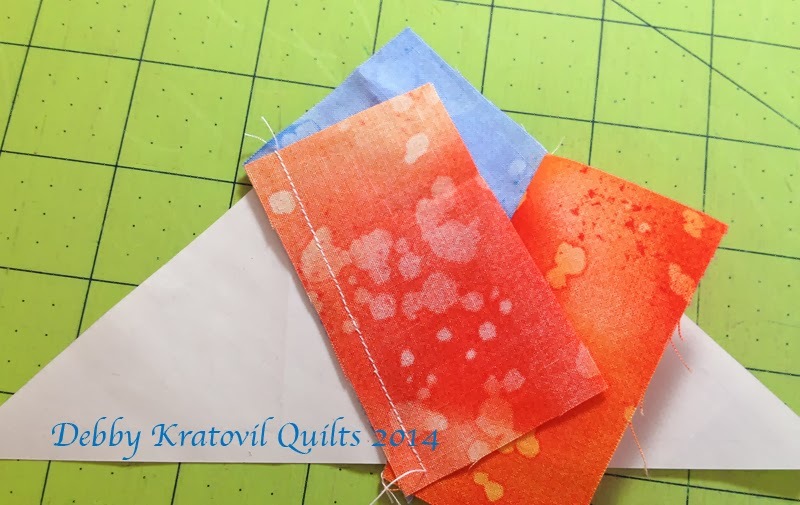 Make sure you read to the end of the post to find out how to enter for a chance to win a fat quarter bundle of fabric! 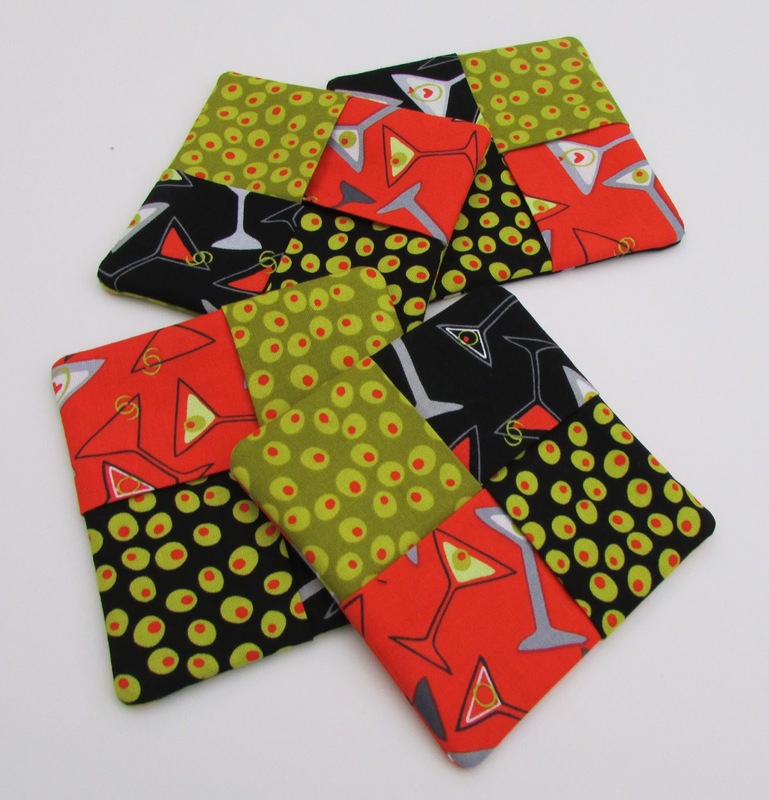 The "Mad Men"-inspired prints from Maria Kalinowski's Shaken or Stirred collection from Kanvas were just begging to be made into hostess accessories! 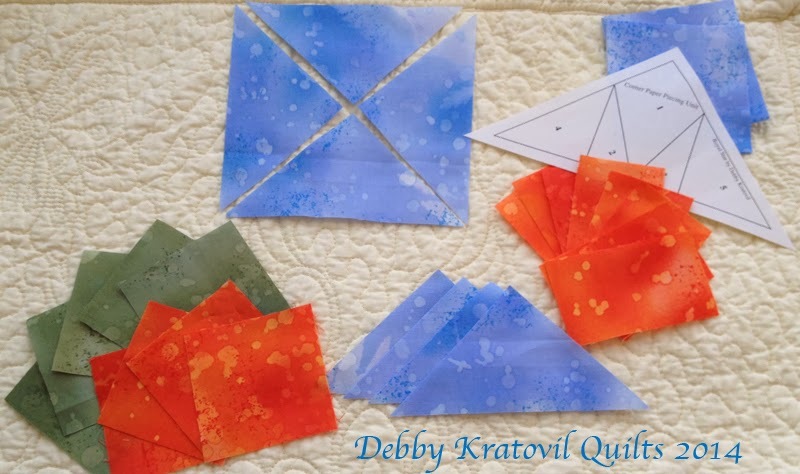 From each print, cut six 6-1/2" squares. 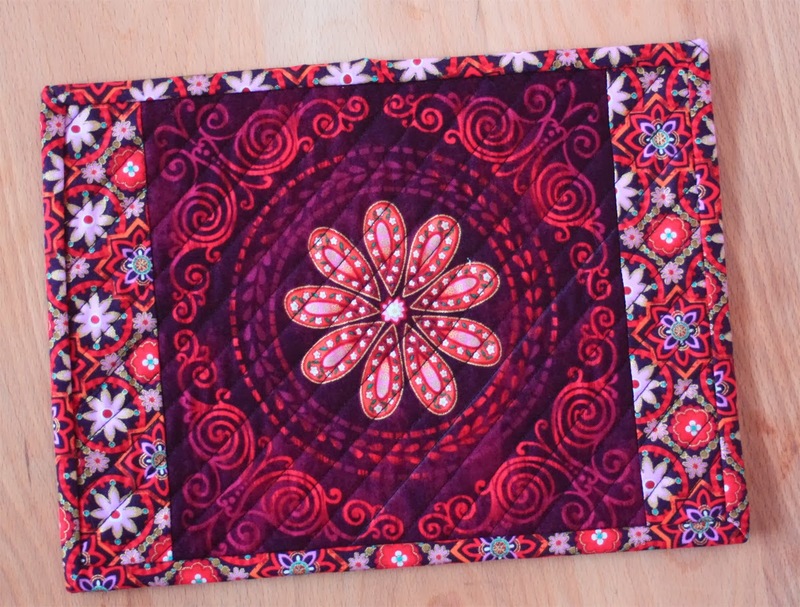 Think this mug rug looks like a simple four-patch? Think again! The design is still simple, but it features a neat folding trick that you'll want to use again and again. Download and print out the rest of the directions here. 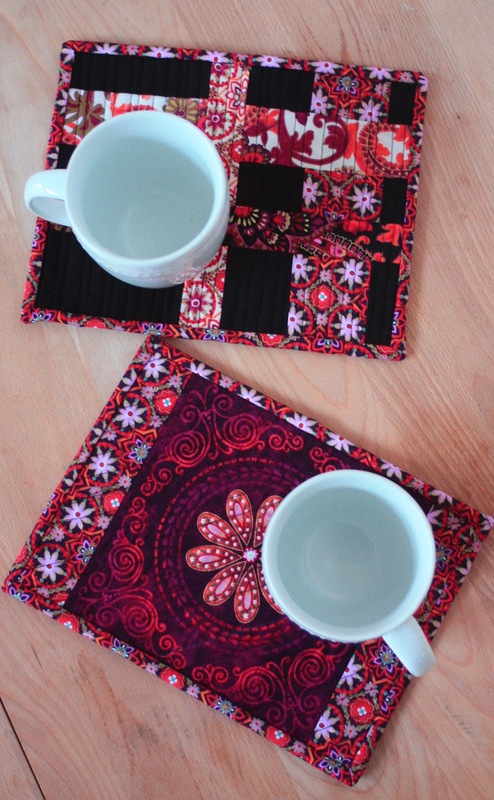 You'll also find free patterns to make trivets (which can also double as larger mug rugs! 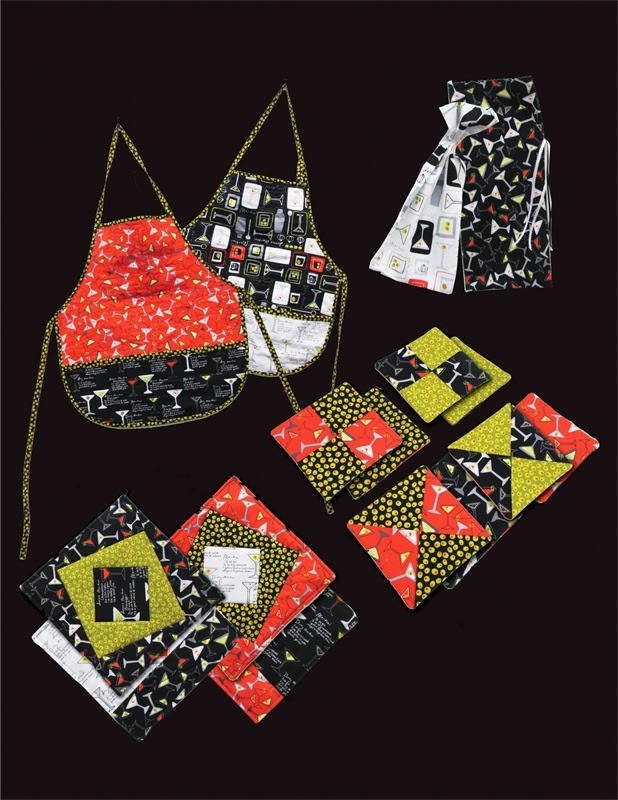 ), wine gift bags, and an apron. Perfect timing with the Super Bowl right around the corner! 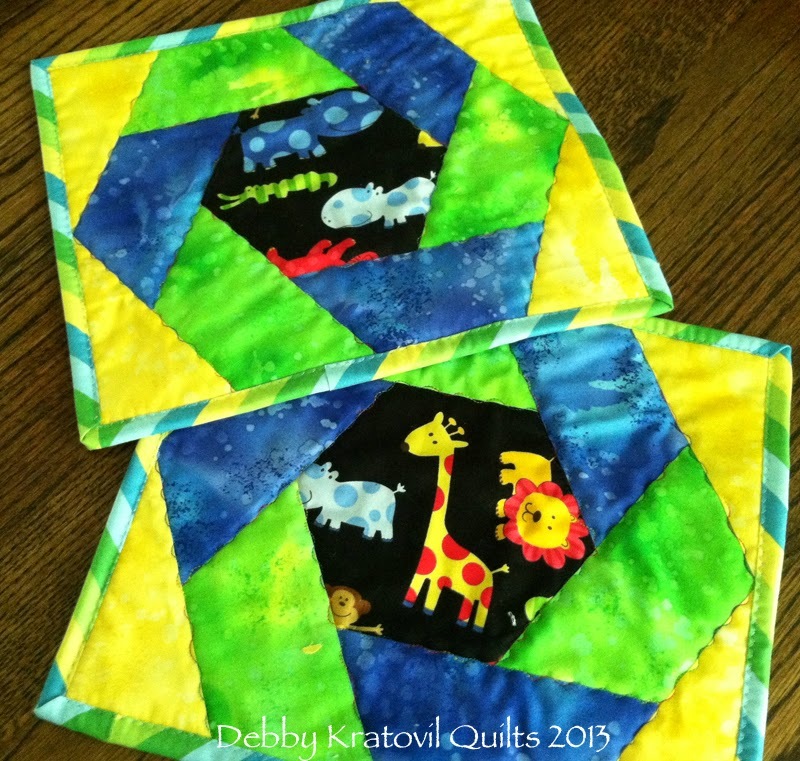 Find the free patterns for all of these sewing projects here. For a chance to win a fat quarter bundle of Benartex or Kanvas fabric, simply sign up to follow this blog, either through Bloglovin' (or another blog reader service) or email (both options are in the right hand sidebar) and leave a comment letting us know you follow. In your comment, also tell us if you've ever sewn an apron. Leave a second comment and receive a second entry by following us on Facebook and letting us know. This giveaway is open through Thursday, February 6 at 11:59 PM EST. 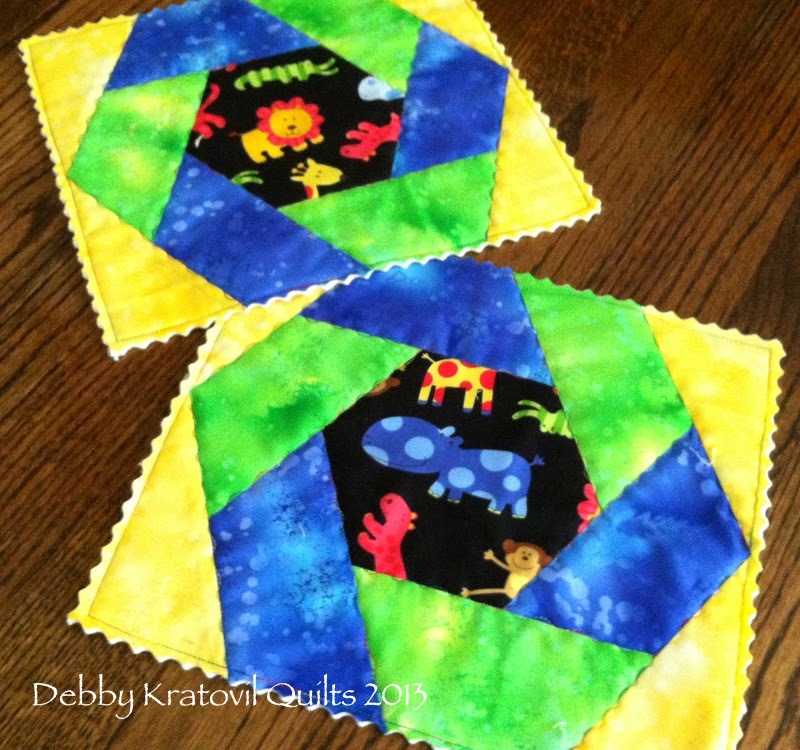 Welcome to Day 2 of our Mug Rug Blog Hop! 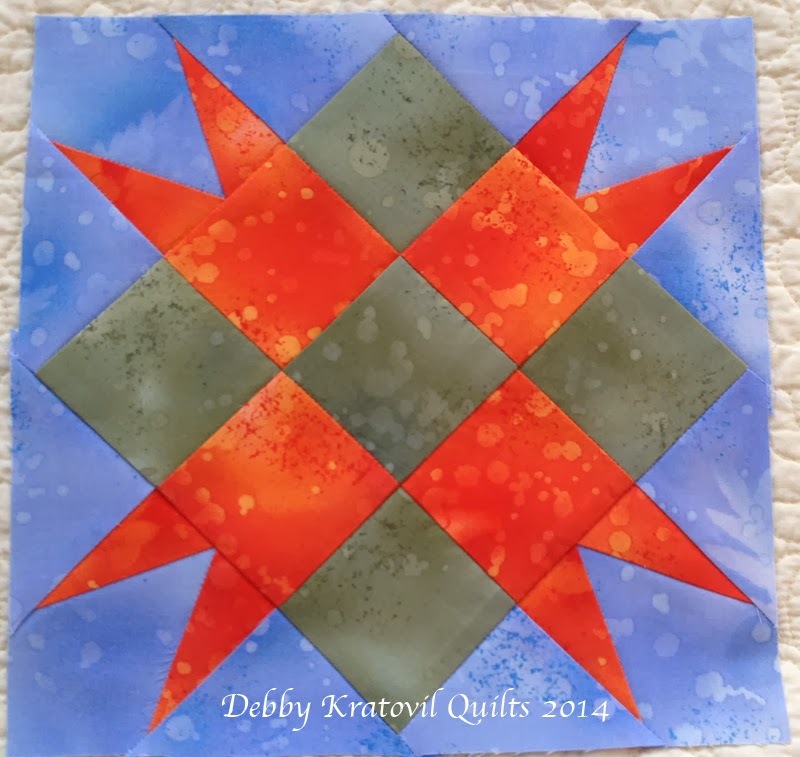 Today Debby Kratovil from Debby Kratovil Quilts is sharing a mug rug made using the beautiful Fossil Fern prints and the Royal Star block. 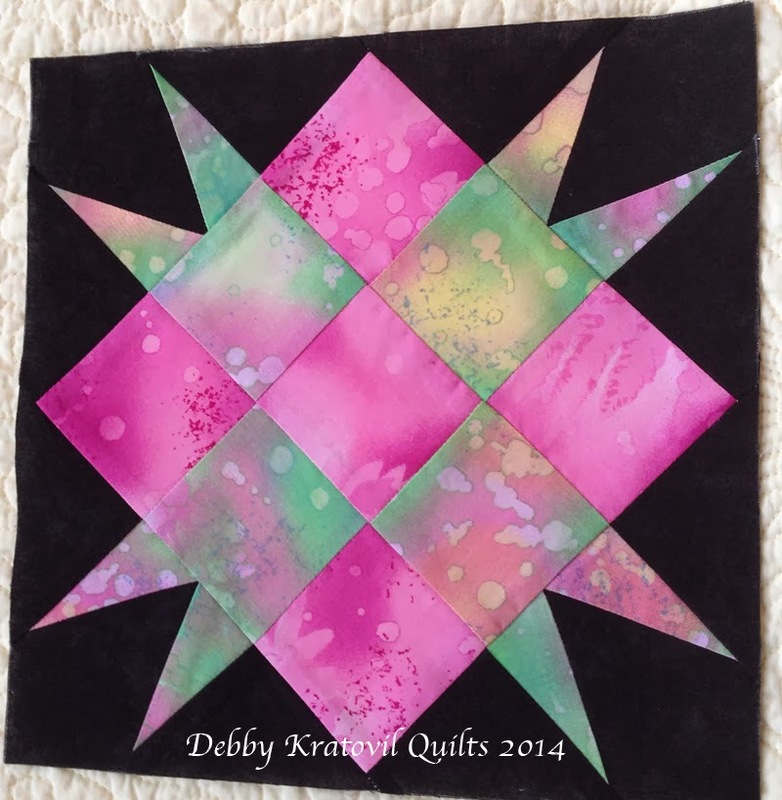 We hope you enjoy Debby's tutorial! 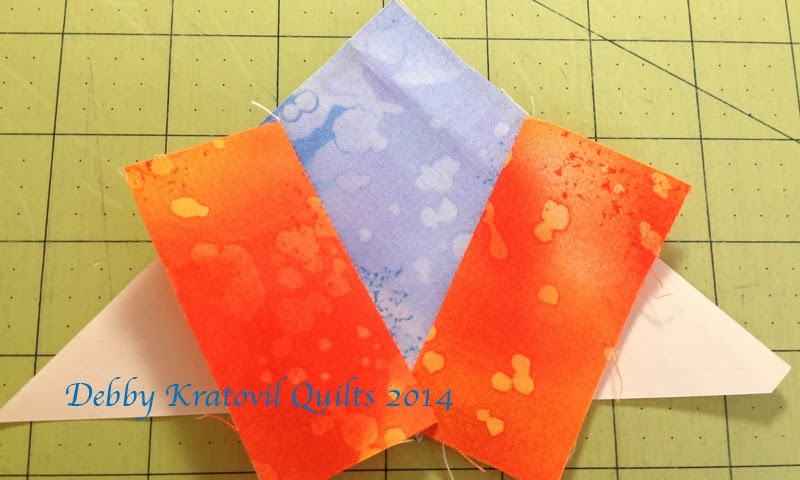 Make sure to scroll to the very bottom of the post to find out how to enter for a chance to win a fat quarter bundle of fabric! Just like a box of candy spilled on my counter top - yum, yum! Hi, Debby here! 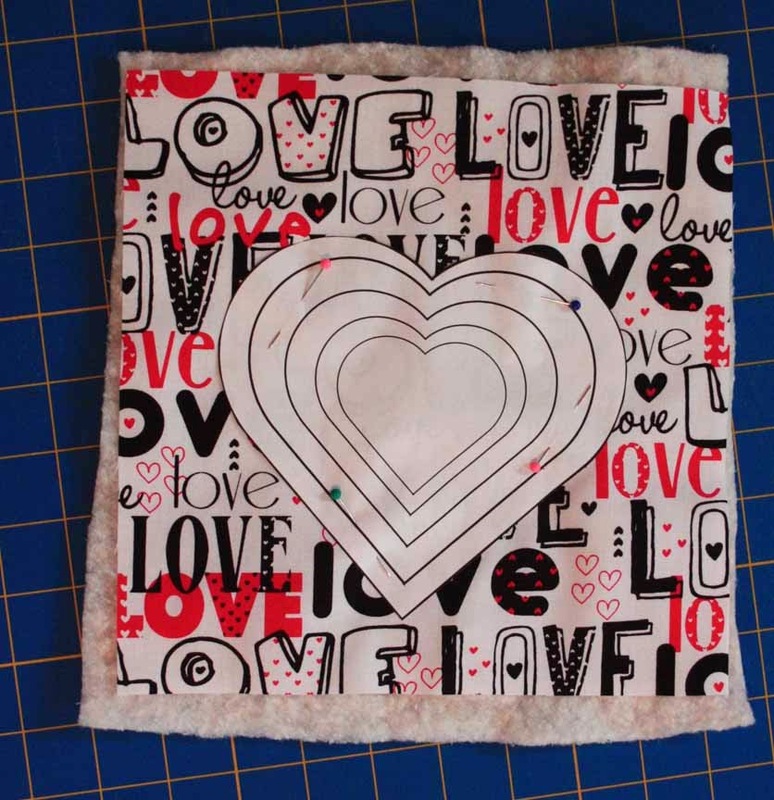 This is my day to reveal a mug rug for the Sew in Love with Fabric blog hop. I knew I wanted to work with the Fossil Fern Collection by Benartex. I've been playing with those fabrics for almost 15 years. 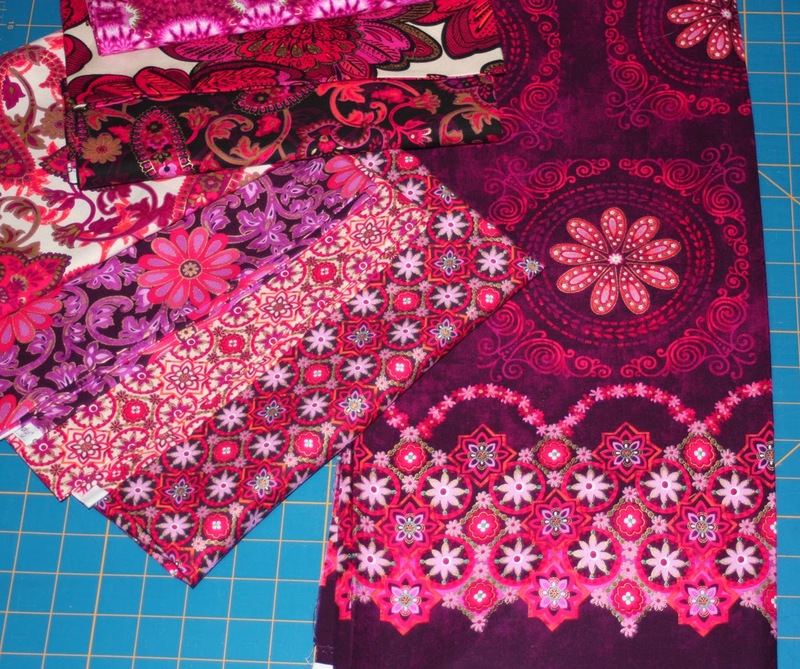 Yes, they still produce these fabrics - never before has a fabric line stayed popular for so long. 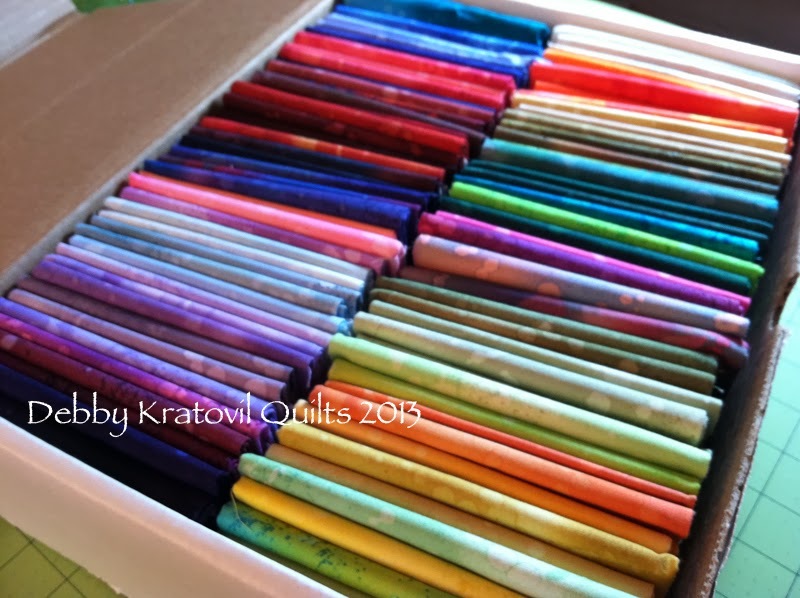 I opened my box of fat quarters (sent to me several years ago by the Marketing Director) and selected a few colors . 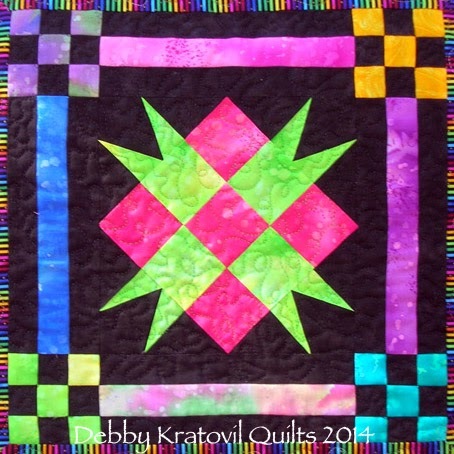 . .
And I revisited one of my all time favorite patterns from one of my all time favorite quilts - The Royal Star. 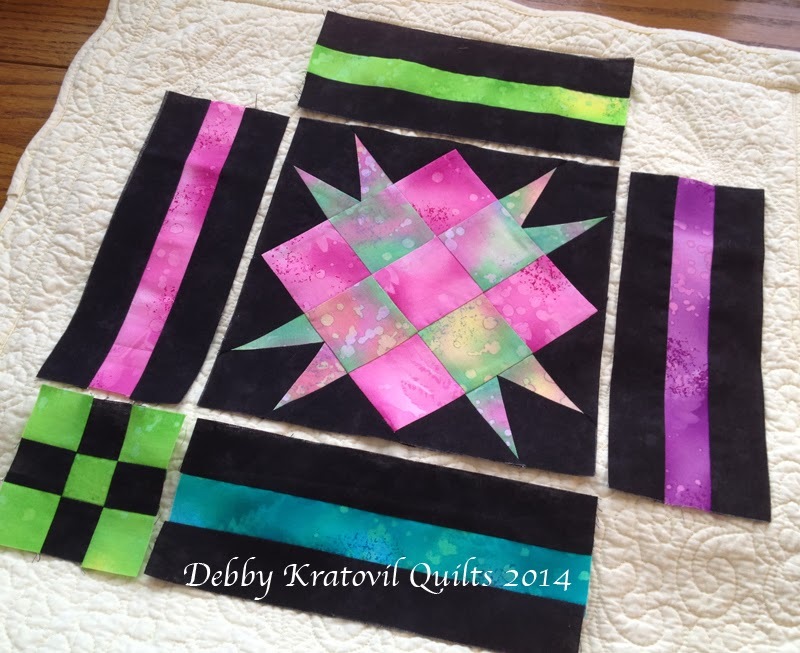 Yes, I will be sharing this pattern - make one block, make 16. But, can I show you first the children's mug rugs I made for my grandsons last summer with some Fossil Ferns and some novelty prints from Baby Safari (also Benartex) . 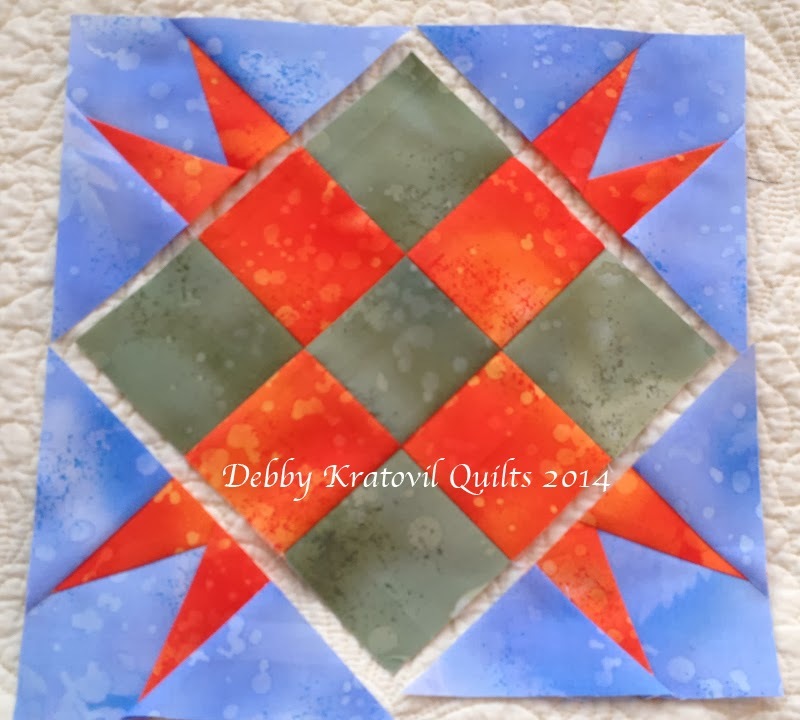 . .
Now for the Royal Star block, paper pieced and then quilted. 2. 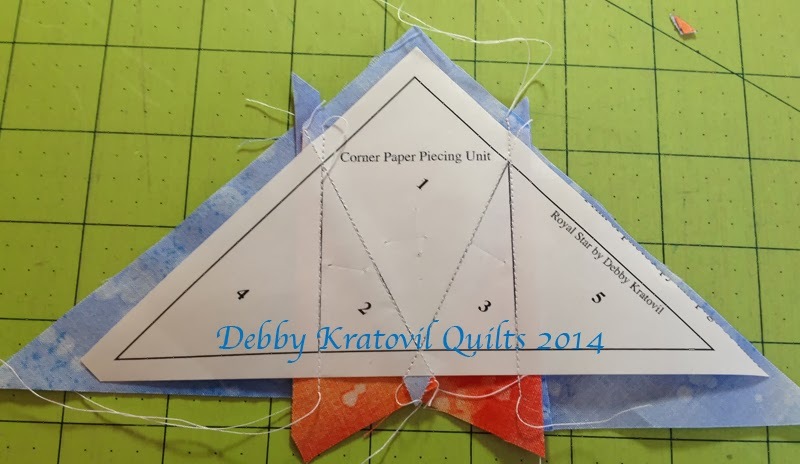 Use the blue square in Position #1 on the pattern. 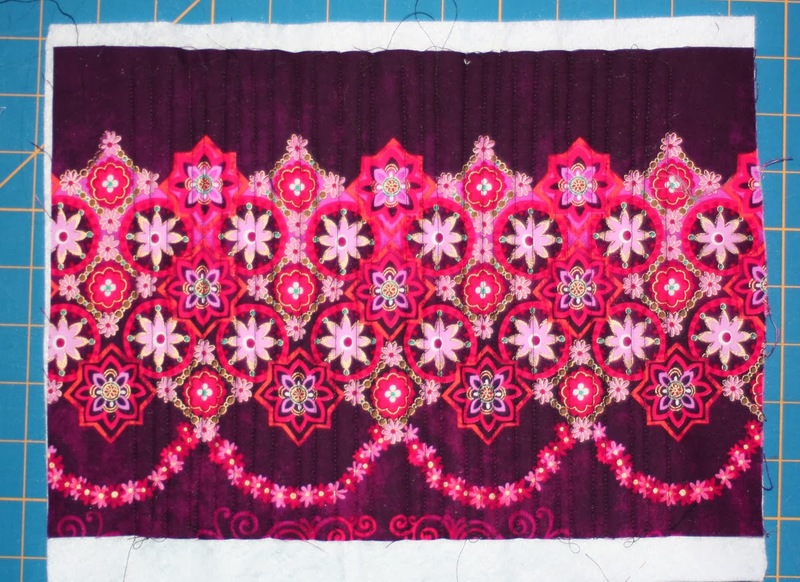 Place it on the UNWRITTEN side of the pattern with the wrong side of fabric touching this unwritten side. 3. 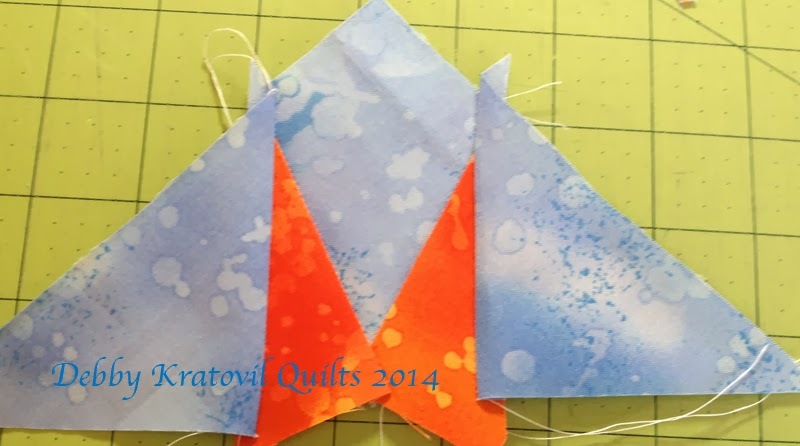 Without turning pattern over, fold back along line between Patch 1 and Patch 2. Trim away excess blue fabric, leaving 1/4" seam allowance. Both sides of Patch #1 trimmed, leaving 1/4" seam allowance from side lines. (Dark) postcard used; fold along line. 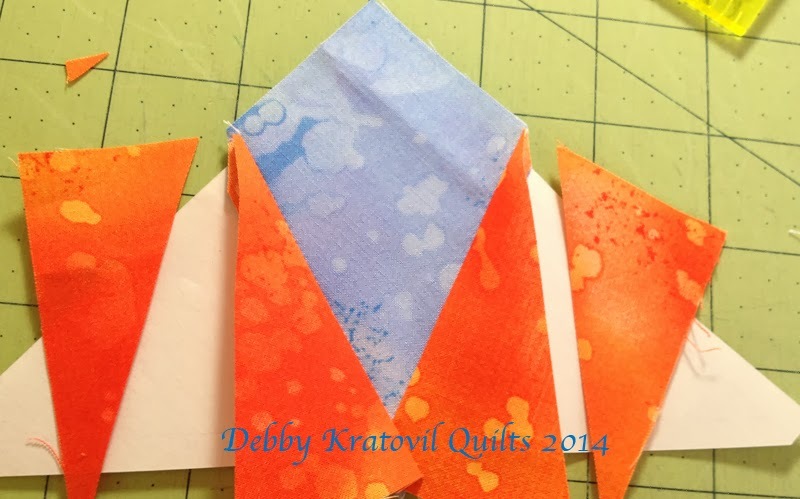 Add A Quarter ruler gives perfect 1/4" seam allowance. 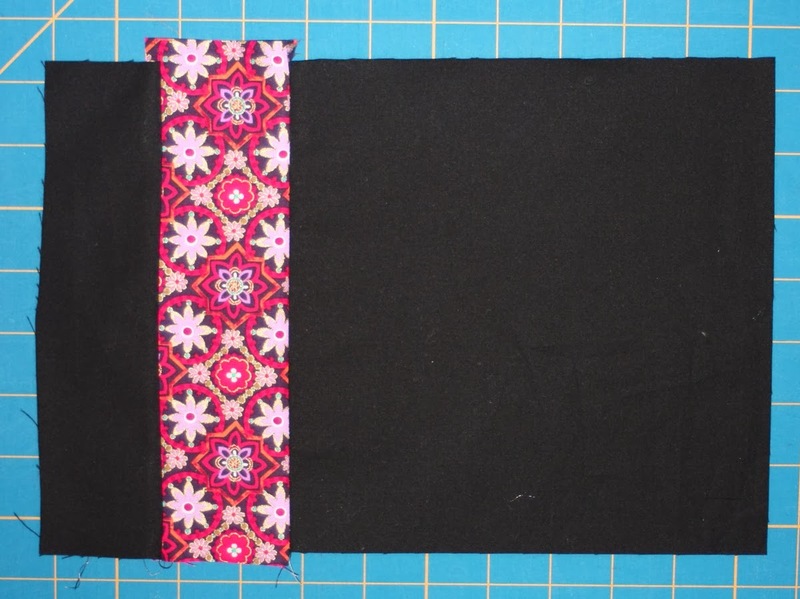 Fabric for Patch #2 pinned, aligned along newly cut edge of Patch #1. 6. Repeat for Patch #3. 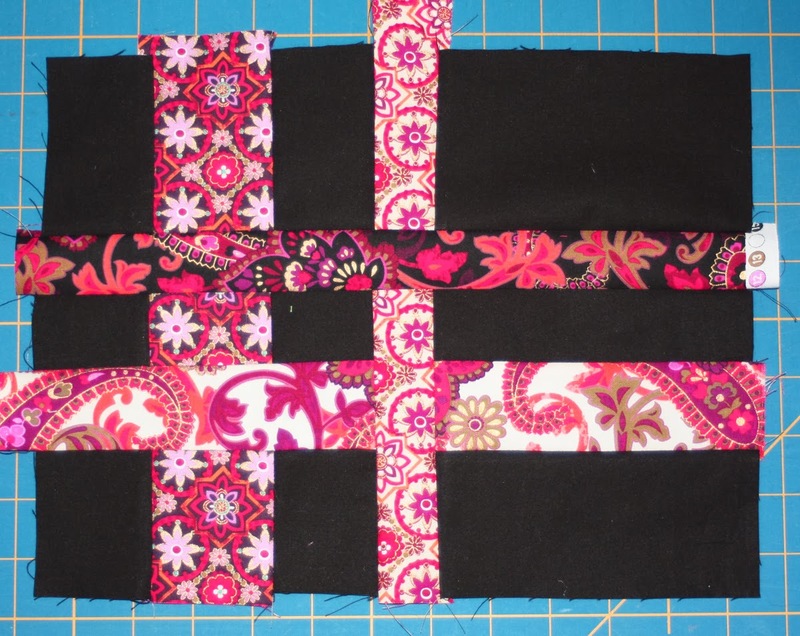 Pin and sew on the side with the lines. Turn pattern over and this is what you see . . .
Patch #3 added. Notice I have sewn from edge of fabric to other edge of fabric. 7. Press patches as shown . . .
8. Time to trim again before you add the last two (blue) patches. ALL trimming is done on the printed side. 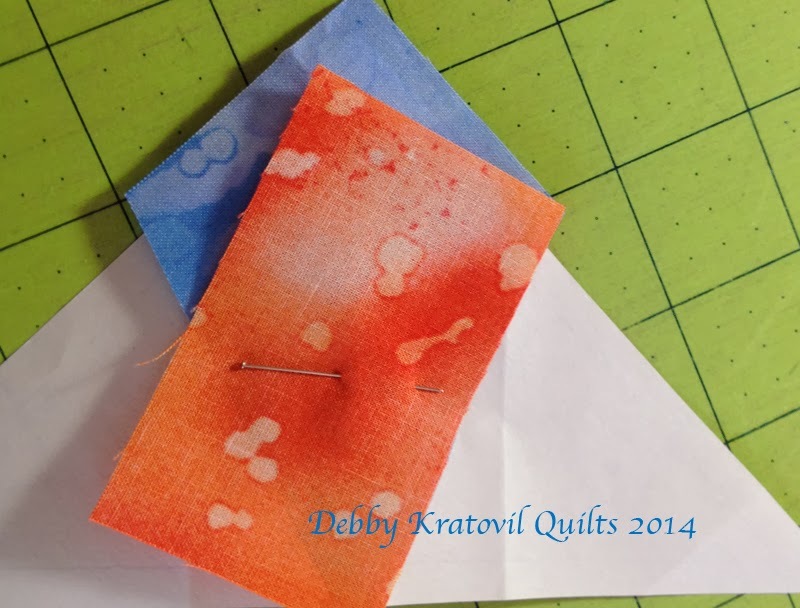 Fold the pattern back on the line, use an Add-a-Quarter ruler for the 1/4" seam allowance. 9. Add Patches 4 and 5, one at a time; press . . .
Star point unit - what a mess, huh? 10. Now it's time to trim excess fabric using the seam allowance markings on the pattern. Turn this over and . . . If you look closely, you can see how I sewed off the paper with every seam. 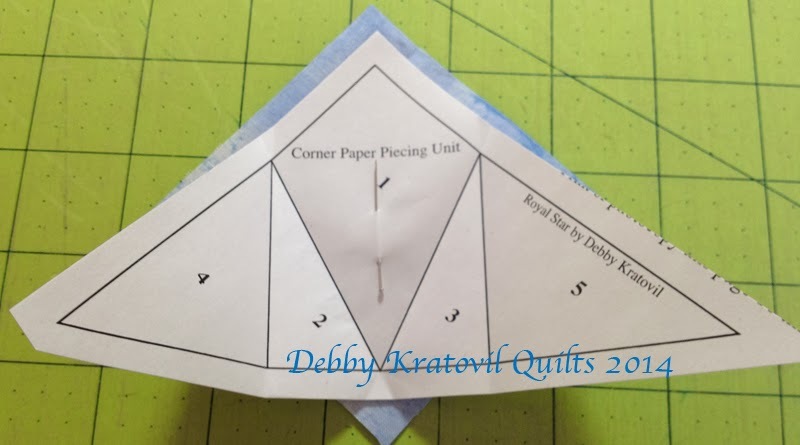 This ensures that I sewed in the seam allowances, just as you do with traditional piecing. Those seams criss-cross in the seam allowances. 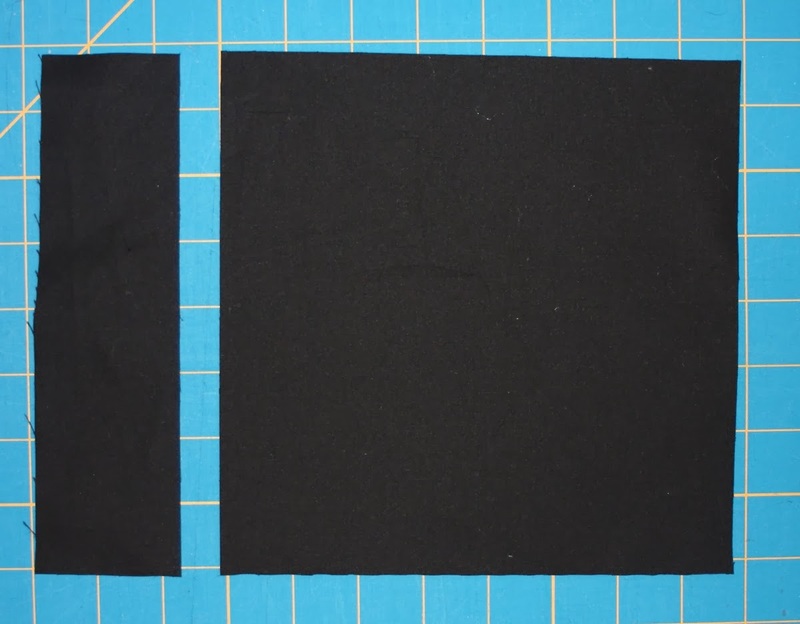 Can you see the excess fabric that extends away from the outside of the paper? 11. 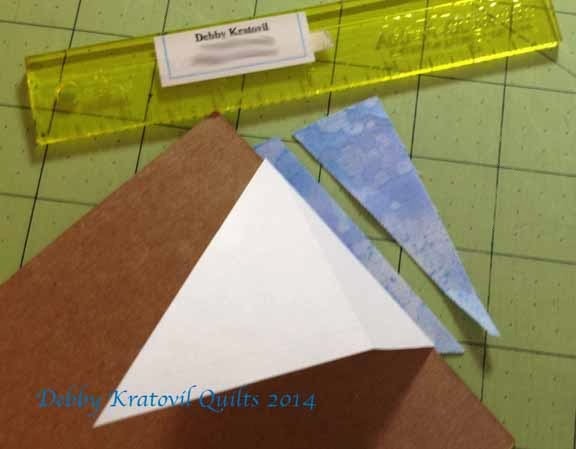 The outside edges of my paper are where I'm going to trim. It is 1/4" away from the outside triangle line of the unit. Wow! It sure looks good when it gets cleaned up. Can we see the front? Glad you asked . 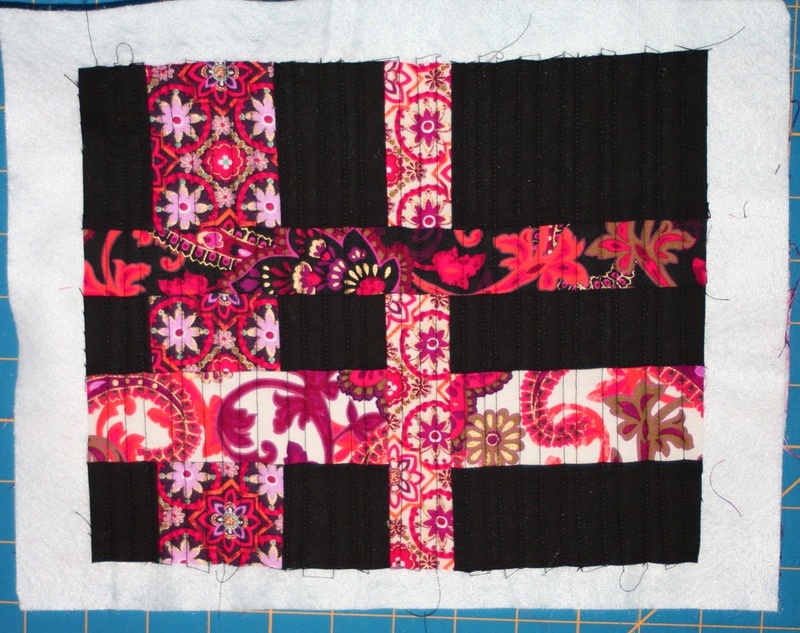 . .
Now it's time to add the Nine Patch (made with 2-1/2" squares) with the Star Points. 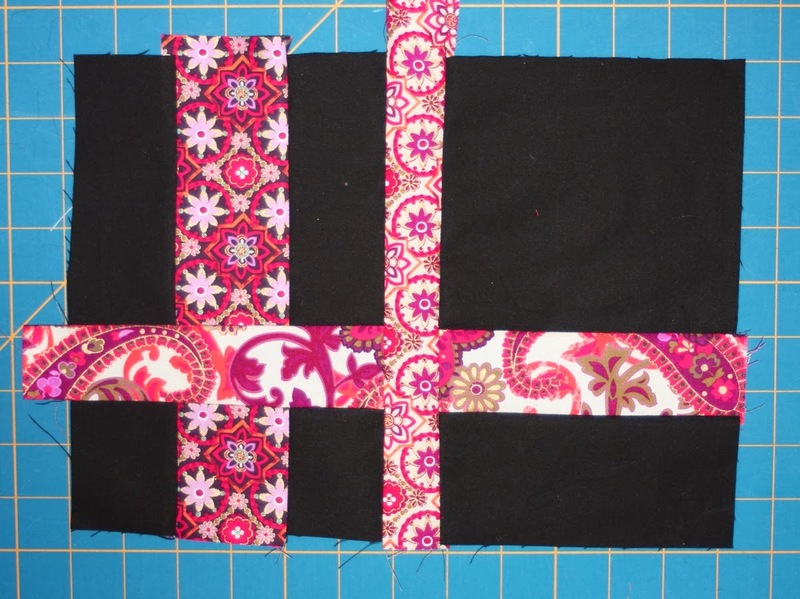 I was just using scraps, so I didn't have enough to make a bigger mug rug. I did have one I made a while ago that I'll show you. But first, let's see another color combination . . .
And here's my mug rug from a previous life . 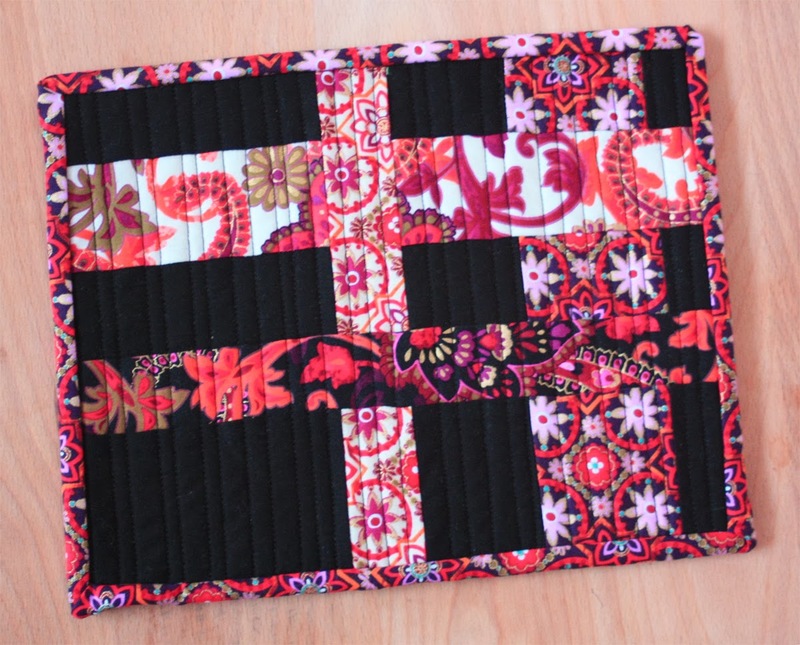 . .
Block size: 8-1/2". 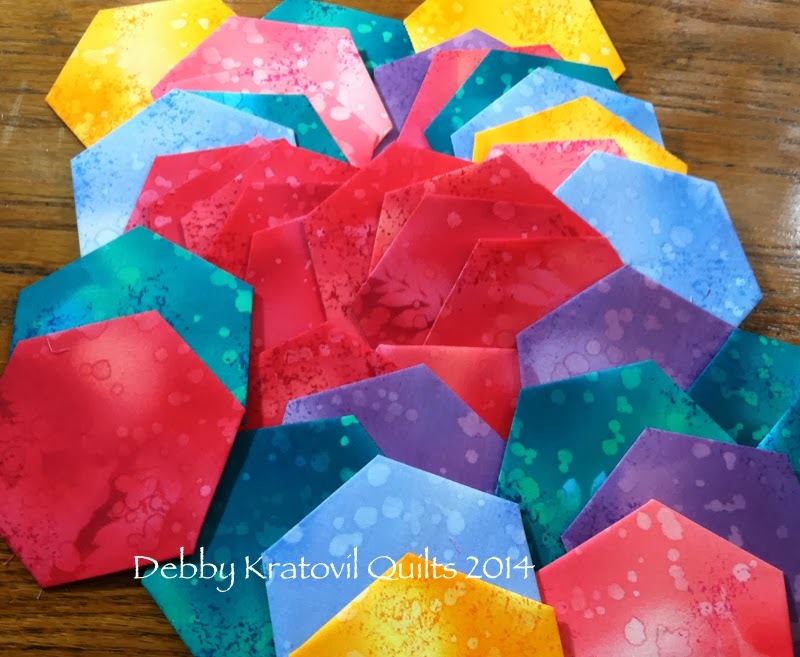 With 1" sashings and squares: 14-1/2" x 14-1/2"
For a chance to win a fat quarter bundle of Benartex or Kanvas fabric, simply sign up to follow this blog, either through Bloglovin' (or another blog reader service) or email (both options are in the right hand sidebar) and leave a comment letting us know you follow. 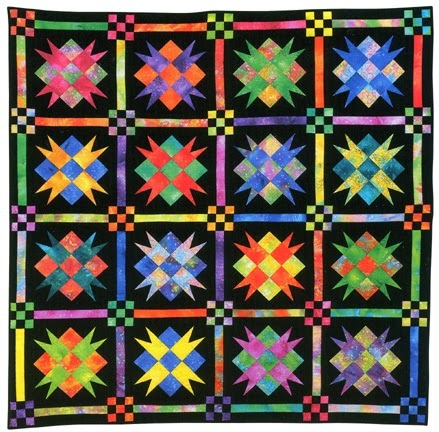 In your comment, also tell us your favorite month for quilting. 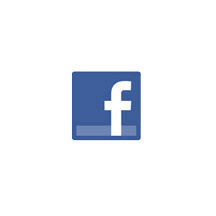 Leave a second comment and receive a second entry by following us on Facebook and letting us know. This giveaway is open through Wednesday, February 5 at 11:59 PM EST.